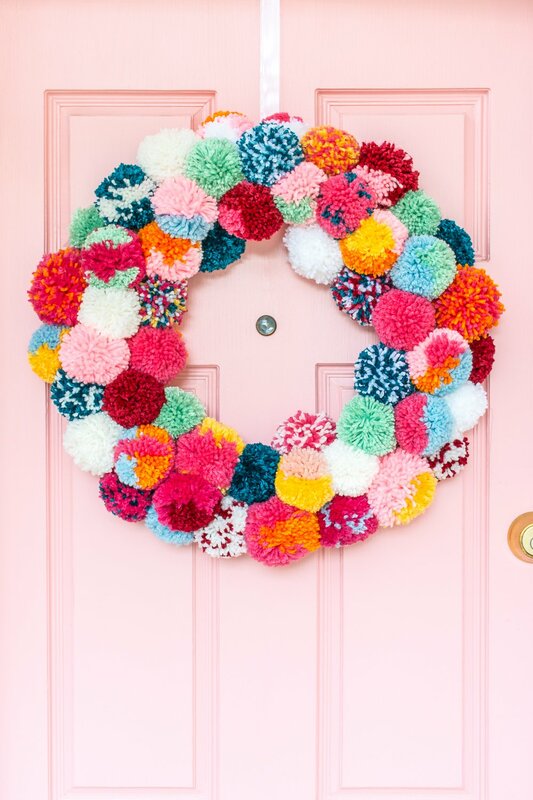 This pom-pom wreath is also a great way to use up yarn scraps you may have sitting around from past projects, so you can start the new year with a cleared out, or at least reduced, yarn stash. And if you have kids, you might even be able to recruit them to help you make a big pile of pom-poms. Make lots of pom-poms, more than you think you'll need. Once I started putting them on the wreath, I needed almost twice as many as I thought I did. The exact number will depend on the size of your pom-poms, the size of your wreath, and how full you want it to be, but I made about 56 pom-poms for this 16-inch wreath. I used a 2 1/2-inch (65 mm) pom-pom maker for most of mine, but also made some in the larger 3 3/8-inch (85 mm) size. Because it is thinner than yarn, tying off the pom-poms with clear fishing line will make them more secure than tying them off with yarn. People also recommend using heavy-duty sewing thread, crochet thread, or even dental floss! 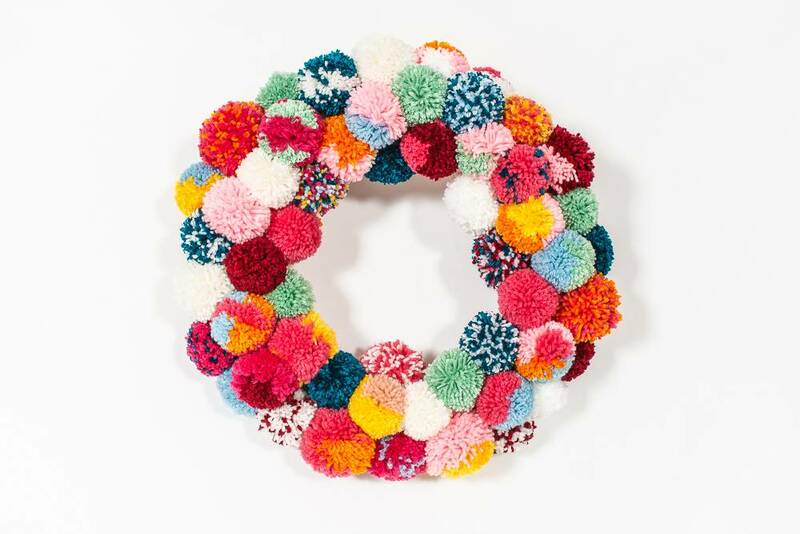 For this wreath, I made a variety of solid and multicolored pom-poms. Experiment with different color combinations and pom-pom styles to figure out what you like best. To make multicolored pom-poms, you can wrap different sections of the pom-pom maker with different colors of yarn, or, for a more speckled look, grab the ends of multiple yarn colors and wrap them all at once. This step takes a while, but it's an easy activity to do while watching your favorite shows or listening to podcasts! Wrap the wreath form with a layer of yarn. Knot the yarn tightly, and tuck in the ends. Attach the pom-poms to the yarn on the wreath form with hot glue. To get an idea of how you'll want to arrange them, it helps to lay out as many as you can on the wreath before you glue them down. Don't forget to share this holiday project on Pinterest! Want to see more holiday decorating with non-traditional colors? Check out some more inspiration here!